M. G. Walker & Bobby Bowes are founders of two prominent glass studios in Silicon Valley — Walker & Bowes® exhibitions have been featured in major national museum venues such as Corning Glass Museum, Palm Springs Desert Museum and Santa Clara’s Triton Museum of Art, and one piece is honored to be included in the permanent collection of the Smithsonian Institute in Washington, D.C. It was the year of 1995 when Bobby Bowes’s idea for the first Glass Pumpkin Patch was born. 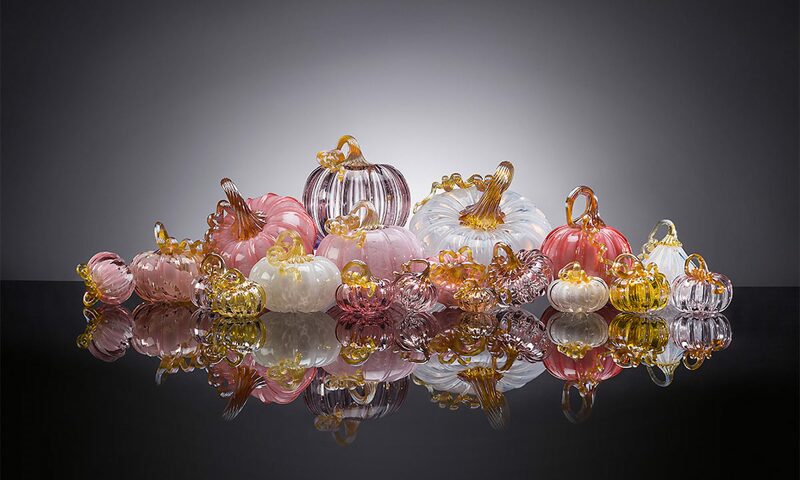 Focusing on Italian style glassblowing, Bowes assembled his team of glassblowers to produce the original Glass Pumpkin Patch installation. This exhibition was so well received that all pieces were purchased on the first day of sale. Community loyalty and support grew this event to the annual phenomena and Bay Area tradition that it is today with more than 46,000 of these one-of-a-kind pieces of art held by collectors. Since 1995, Walker & Bowes® remain the instrumental force behind Walker & Bowes Glass Pumpkin Patch, a major fund-raiser, raising more than $2 million in funds for the community and local artists. As their glass pumpkins have made their way into collections around the globe, The Walker & Bowes Glass Pumpkin Patch® tradition has also expanded across the nation, raising funds for numerous non-profit programs for local children, communities, educational programs and to organizations as diverse as MIT’s glass studio and the Corning Glass Museum. The Walker & Bowes Glass Pumpkin Patch installations have been held at the Stanford Shopping Center, on the Stanford University Campus, Palo Alto, CA. Stanford, being an international landmark, is the perfect back drop for this event. As a husband-and-wife team, Michele Walker and Bobby Bowes live and work in San Jose, California with their three children. Their education consists of time at Pilchuck Glass School, World renowned Italian glass masters and are both graduates of San Jose State University with Bachelor of Fine Arts degrees. They continue to focus their art on the development and execution of significant art installations for private and civic entities, not-for-profit entities, and local communities.